The sheaf stitch is a surface embroidery stitch that can be worked singly as a design element, in rows, or in a random or evenly-spaced pattern as a filling stitch. It can be worked freestyle or counted using an evenweave fabric. The stitch is composed of three vertical stitches which are tied or wrapped together with a horizontal stitch. It gets its name from the bundled threads resembling a sheaf of wheat. To work the sheaf stitch, make three vertical straight stitches. As you complete the third stitch, bring the needle up to the center-left side of the group of stitches (point 1). This should come up under the vertical stitches, so make sure your needle doesn't split any of the threads. Next, slide the needle under the vertical stitches, going from right to left. As you do this, the working thread wraps the three stitches, pulling them into a bundle. End the stitch by inserting the needle to the center right of the bundle (point 2), so the wrapping is centered. You will see that the horizontal stitch that bundles the threads is doubled, but it is just a single wrap. This is because the thread crosses twice on the front of the vertical stitches and once across the back. As you slide the needle under the vertical stitches to wrap them, do not catch the stitches. A blunt needle can help. This stitch usually has the look of a band around the middle, like a bundle of wheat. Keep the horizontal stitch centered and in from the edges. 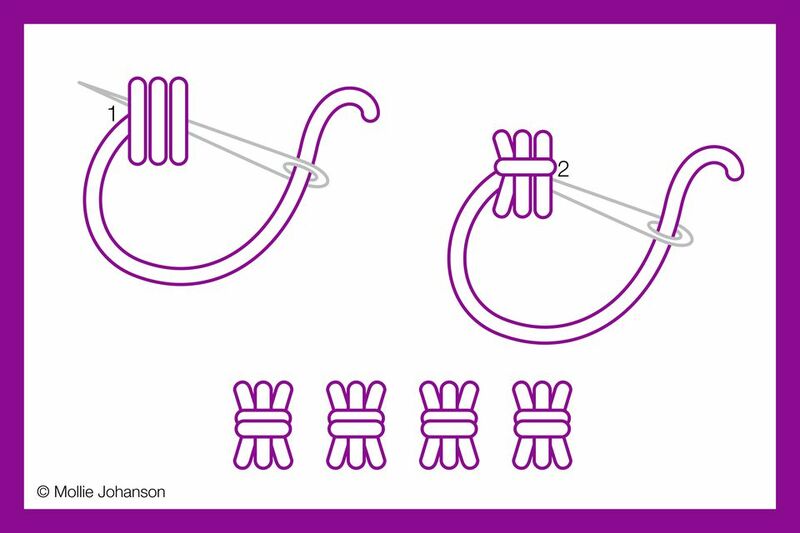 For a tighter bundle, come up closer to the center and tie the stitches a little tighter. Likewise, make a looser bundle by coming up close to the edges of the vertical stitches. Keep your stitches at a size that prevents them from being easily snagged or becoming loose. The wrapping on sheaf stitch helps with this. You can make this stitch at a decent size. Add variety to your sheaf stitches by working them in one color for the vertical stitches and another for the wrapping. Although three vertical stitches are standard for sheaf stitch, why not try adding more? You could even add some depth by layering more than one color. For another variation, try making the center stitch a little taller than the others, or working the horizontal wrapping higher or lower. The sheaf stitch makes a great border when worked in rows and combined with other stitches. Try it with cross stitches, French knots, lazy daisies, and more. For example, stitched in green, the sheaf stitch could act as a bundle of stems for a tiny bouquet of embroidered flowers. As a fill stitch, this can be rotated and scattered similarly to the fill on this silhouette stitching. Or, work the little sheaves close together in rows to make a more solid section of embroidery. In addition to looking like a sheaf of wheat, this stitch would make cute little bows or bow ties, butterflies, or mini yarn skeins. Use your imagination as you find new ways to apply this easy stitch.